Why the bloody hell has it taken me so long to finally try out this Anastasia Dipbrow Pomade. I don’t know why it took me so long to finally buy this product and catch up with the rest of the world, but I have finally caved and bought it, and it is about bloody time. I have wanted this Anastasia Brow Pomade for the longest time but I kept on talking myself out of it before I clicked the purchase button. This product just kept throwing me and I didn’t know if it would work out for me the way that I wanted it to. Before I buy any new makeup products I always look into reviews to see what other people think of them and this one always had 5 star reviews and that made me want to buy it and try it out for myself. But, what stopped me from buying this for the longest time was that I would see other people using this Anastasia Dip Brow Pomade in YouTube videos to fill in their brows and it just made their brows look far too hard and waxy in appearance and personally I just didn’t think that it looks very nice and it isn’t for me. My own eyebrows are very full and thick. If I let them grow I am sure they would take over my whole face. They give Cara Delevingne's eyebrows a run for their money which says something. When I was younger I was a victim of over plucking, because I hated my eyebrows when I was at school, so now I have sparse areas that I like to fill in to make them look nice and thick. I have always had to fill in my eyebrows and before I bought this Anastasia Dip Brow Pomade, I used to use a deep brow powder to fill in my sparse areas. My favourite eyebrow powders were either a standard brown MAC eyeshadow or the Illamasqua Brow Cake in the shade Thunder and I have been using them simultaneous for years now. The reason why I wanted to try something new was because sometimes I found that a powder wasn’t deep or rich enough to match the rest of my eyebrow hairs. So, I wanted something with a different texture to really intensify the colour, which is where this product comes into play. In the end, I finally caved in and bought this Anastasia Brow Pomade. It took me a while after looking at swatches online and through Anastasia Beverly Hills’ Instagram to find my right shade, but I feel like I finally got there in the end with the shade Chocolate, which is a lovely deep brown shade. I bought mine from Beauty Bay and I have been loving it ever since I received it through the mail. I am going to be really honest now and admit that for the first couple of weeks of trying this product out, I had more than a few makeup disasters. There was hell of a lot of trial and error when I was first using this. I looked at so many YouTube tutorials of different ways to apply this for me, but I just couldn’t get it to work. I would say that it took a good month or so before I got the hang of it properly. I did buy the Anastasia brush that goes hand in hand with this Pomade and I am so glad that I did because the edge of it is so fine that it allows you to do really fine lines and mimic the look of hairs. My favourite way to use this Pomade is by taking a small amount on my brush and starting by carving my brows out underneath. I don’t mind if he underside of my brow is a touch strong, then with the product that is left on my brush I will drag it upwards through my brows to get a soft look. I find that this give me a really natural and fluffy look on top, which is what I always try to go for. 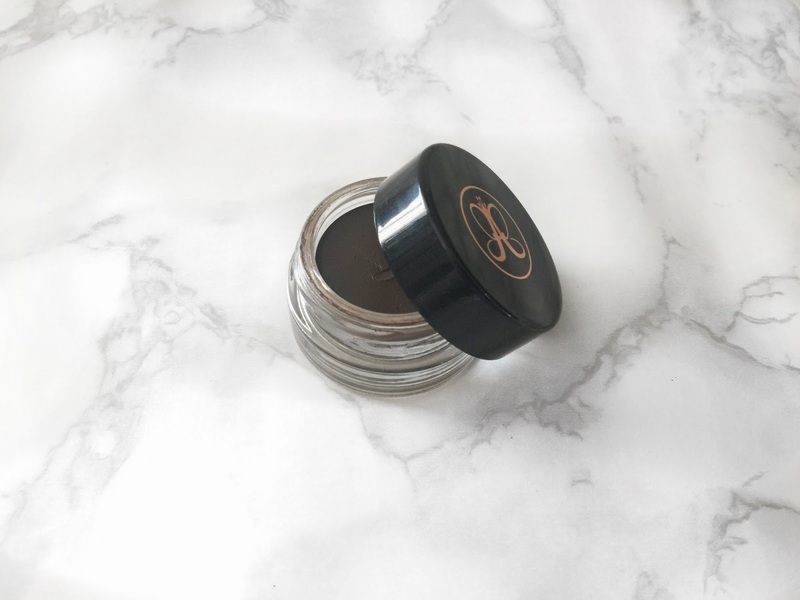 One thing I was worried about with this Anastasia Brow Pomade when I first started using this was that it was going to stay wet and smudge on my face throughout the day. But that isn’t the case at all, when it is applied to the face it sets into place and then you are good to go for the day. I have worn this Pomade and gone out in the pouring down rain and at the end of the day my brows were still fixed in place. What I do really like about this product is how nice and pigmented it is. Just the smallest amount of this goes a really long way. I have been using this product for months now and it looks like I have barely made a dent in the pot, so I am thinking that this is going to last me for a very long time indeed. I also love that when I reach for this product I then don’t have to worry about using a brow gel or any other products, because this does everything that I need. I have really fallen in love with this product and I am slowly but surely working my way down the pot. It is such a good product and I can see myself using it for a very long time. I think I paid around £20 for this from Beauty Bay and I think that the brush that goes alongside it was about another £10. The pot is going to last for such a long time and I think that it will be great value for money. I will leave a link to this down below in case anybody wants to try it out for themselves. Make sure to leave me a comment down below if you have tried this out for yourself and let me know what you thought!